Living in Australia, it’s kinda hard for me to imagine a landscape like the icy cold winter that sets the scene in this game. And I’ve got a feeling the reality couldn’t match the beauty here. Even still, it is clear that WINTER can be HARSH, and this is a game set in FROST & ICE more than SNOW FLAKES. 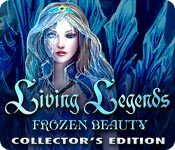 In a STORY not dissimilar to one recently released about Cinderella, this game tells the tale of an envious queen determined to keep her youth and beauty no matter the cost to others. SNOW WHITE is just the first of her victims, and your SISTER will be the latest unless you SAVE her. She has foolishly accepted the INVITATION to prove herself worthy as the future SUCCESSOR to the QUEEN’S THRONE. A DELIGHT to look at, this game’s ARTWORK is top notch, but the first thing I noticed was the SOUNDTRACK. Perfectly suitable MUSIC was accompanied by AMBIENT sounds of the wind that sounded like it would cut right through you. The CHANGE of SCENERY when an area was ‘THAWED OUT’ was very well done. 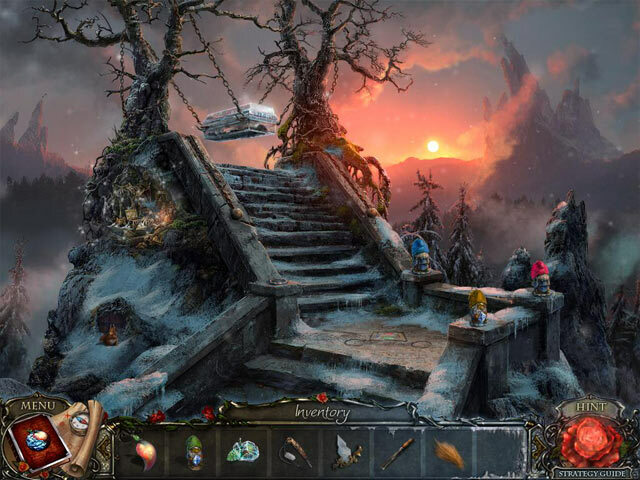 The GAMEPLAY is a well-balanced assortment of HO SCENES (INTERACTIVE LIST, PROGRESSIVE SILHOUETTES (find this, to do that, to get this) & MULTIPLES), and PUZZLES of VARYING DIFFICULTY & ORIGINALITY, all encompassed in a fun ADVENTURE. The ADVENTURE side was RELATIVELY EASY, with INTERACTIVE JUMP MAP & DIRECTIONAL HINT, QUICK SKIP. The JOURNAL kept necessary info, and allowed you to REPLAY CUTSCENES. My FAVOURITE thing in this game was the SQUIRREL. Yes, she was CUTE, but I still like cute even with the excess these days. The CE game offered more opportunities to interact with her than the SE version does, but it’s great that she is not cut out of the game completely – as I’d expected she would be. The STORY ends CONCLUSIVELY with this version, so I don’t think the CE is necessary for that. And since my delightful squirrel pal hasn’t been cut, it is only all those ACHIEVEMENTS and an unnecessary but reasonable BONUS CHAPTER that might tempt you to buy the CE game. The main game ended satisfactorily, and this one carried on from there with a further only marginally related adventure. Mainly new LOCATIONS, but some OLD ones REWORKED as well. ACHIEVEMENTS did NOT continue through this chapter. Main game took me about 4.5 hours, and the bonus just over 1 hour. You get to befriend a SQUIRREL in the earlier part of the game, and can use COINS collected throughout the game to DECORATE her house. There’s an achievement related to her as well. There are quite a lot of ACHIEVEMENTS and you have a great TROPHY room in the EXTRAS menu for them. They include both essential game milestones and speed/accuracy/puzzle stuff. The ONLY COLLECTIBLES are the squirrel’s COINS. The USUAL GALLERY ITEMS were VAMPED UP by: SCREENSAVERS that were some of the CUT SCENES, and CONCEPT ART that, when you hovered your cursor over them showed the FINAL SCENE. I thought that was EXCELLENT. In fact, the whole game was EXCELLENT! Options include separate sliders for Music, Sound & Voice, custom cursor, fullscreen/Windowed, maintain aspect ratio, and the ability to change your difficulty level at any time. There are three difficulties to choose from, each clearly defined on the selection page. The first HOS we had was highly-interactive, with things to find and place in the scene in order to find more items. Sadly, there were only three of these in the game, with the rest of the HOS being your standard, slightly-interactive fare, and each of which being visited twice. There IS a mis-click penalty - even in Casual Mode - but you have to click pretty rapidly for it to come up. The artwork is gorgeous, with many of the scenes having a moment or two with no HUD present -- Perfect for people like myself who love taking screenshots! There are four orchestral pieces, all of which are lovely, and which can be saved on your computer in the EXTRAS portion. Some of the voices are really professionally-done, and the rest are pretty good. Sound effects were well-picked and non-invasive. The save-your-sister storyline is nothing new, but I really enjoyed the way the devs incorporated well-known fairy tale characters into the mix. The protagonists were likeable, and we had a companion for a good portion of the game. There is one collectible - squirrel tokens - which we use to upgrade our pet's home. Everything wraps up nicely, but there's juuuust a bit of ambiguity to suggest the storyline for another game. The extra gameplay takes place immediately after the ending of the main game, and was just as enjoyable as the main game, and with 15 locations to visit - some of them brand new, some of them revisited but... changed. 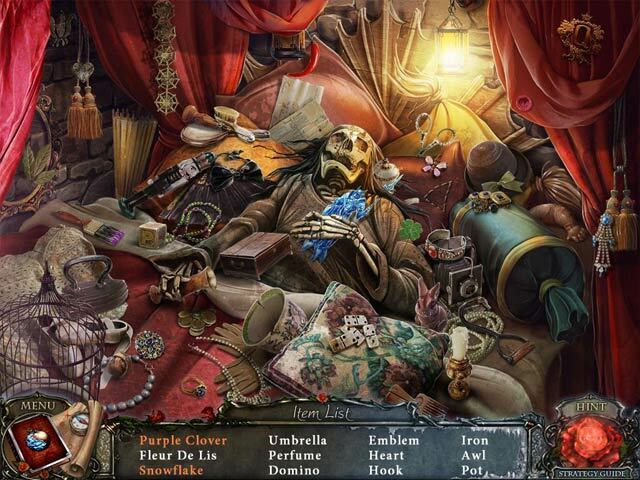 This second Living Legends installment is a solid, beautiful and entertaining hidden object game that will likely take you between four and six hours to complete, depending on your style of gameplay. I definitely enjoyed myself, and recommend it to my fellow IHOG fans.